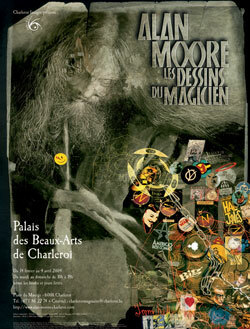 Ten years ago, from February 14 to April 4 2004, I curated Alan Moore: Les Dessins du Magicien at the Palais des Beaux Arts in Charleroi, Belgium. 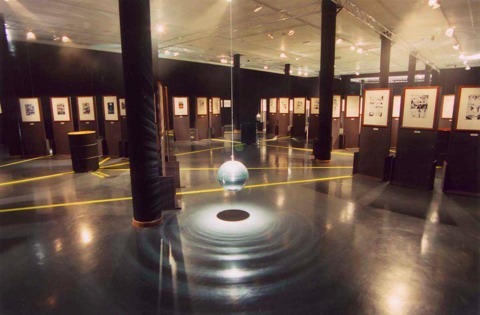 It was conceived around the systems and meanings of the Kabbalah into ten thematic sections: An Extraordinary Gentleman; Mysteries of the Everday; Superpowers; Energies from the Past; Lessons of History; Shocks of the Future; Power Games; Force of Imagination; Power of Love; and Living Magic. 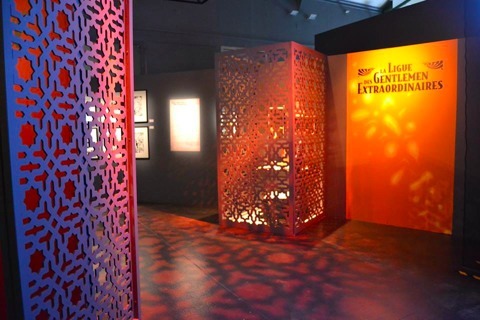 At its core was an extensive display of over two hundred pieces of original artworks lent by artists and collectors in the UK and USA, in a theatrical installation imaginatively designed by Winston Spriet (above). 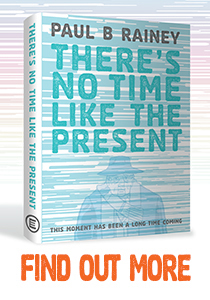 There are more photos at Ultrazine’s site and this was the poster, adapted from the cover by Dave McKean of George Khoruy’s 2002 volume The Extraordinary Works of Alan Moore from TwoMorrows Publishing. You can read a thoughtful report and review on the Shadow Gallery website, an introduction and details (in French) on ActuaBD’s site. And here’s the link to an overview in French on Auracan’s site and a recovered and reformatted montage video from the time of shots and artwork from the exhibition, courtesy of Auracan web television. This was not the first such exhibition to present Moore and his major collaborators. 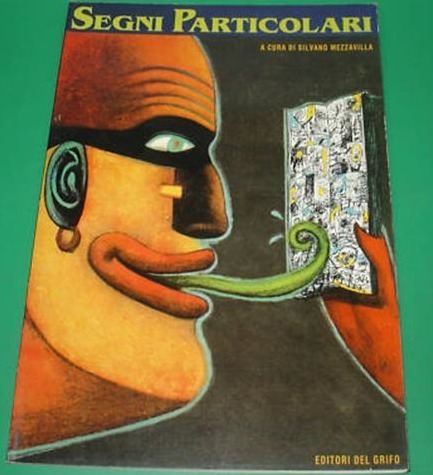 Back in 1991, I had helped co-ordinate an earlier, more modest survey for the 16th Treviso Comics Festiva in Italy, run by the charming Silvano Mezzavilla and presented from March 3 to 17 in the beautiful Palazzo dei Trecento. Which brings me to the latest exhibition on Alan Moore and the co-creators and artists he has worked with, the first of its kind in France. It’s presented in the Galerie Zola, 8/10 rue des Allumettes (a former match factory, now a massive library and arts centre in Aix-en-Provence, France) from April 1 to May 10 2014, as part of the 11th Rencontres du 9ème Art, a wonderfully fresh, progressive and totally free comics festival, among the very best in France. 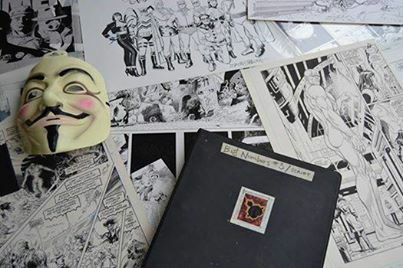 My good friend and comics connoisseur extraordinaire Jean-Marie Derscheid has curated a really impressive and immersive exhibition, focussed on four major masterpieces - V for Vendetta, Watchmen, From Hell and League of Extraordinary Gentlemen - plus a closing section, ‘The Alan Moore Galaxy’ looking at some of his many other projects. 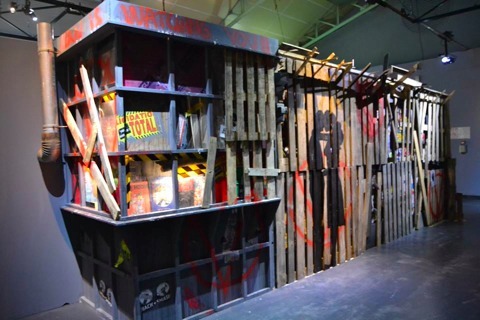 Among the setpieces are this reconstruction of the pivotal newsstand from Watchmen (above), and for the V section, this stack of television monitors linked to surveillance cameras in the gallery (below). Dave Gibbons, David Lloyd (below) and Kevin O’Neill were sadly unable to attend, but they have lent some outstanding pages of their artwork and Gibbons has included numerous sketches, layouts and other rarely seen items. Derscheid has also borrowed from collectors, including Joseph Melchior and Billy Hynes who join me on April 11 to 13 for the festival’s main weekend of public events. 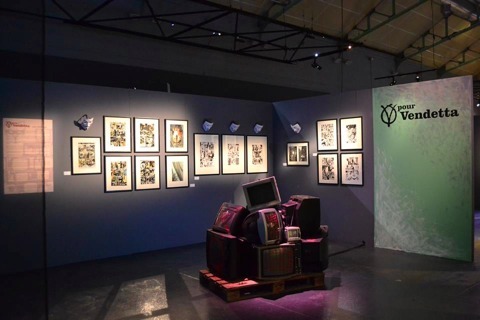 It’s a theatrical, spectacle-based show, combining art and artefacts with atmospheric decors to convey the moods and themes of this quartet of graphic novels. 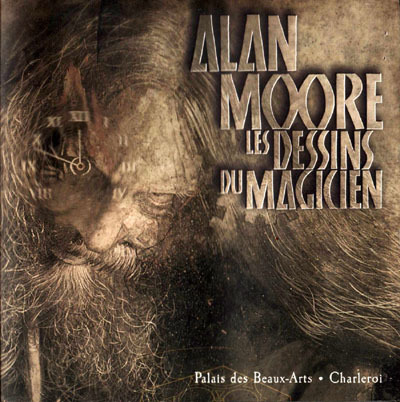 Throughout, short clips from DeZ Vylenz’s highly-recommended documentary The Mindscape of Alan Moore are played with French subtitles to set the context for each section.